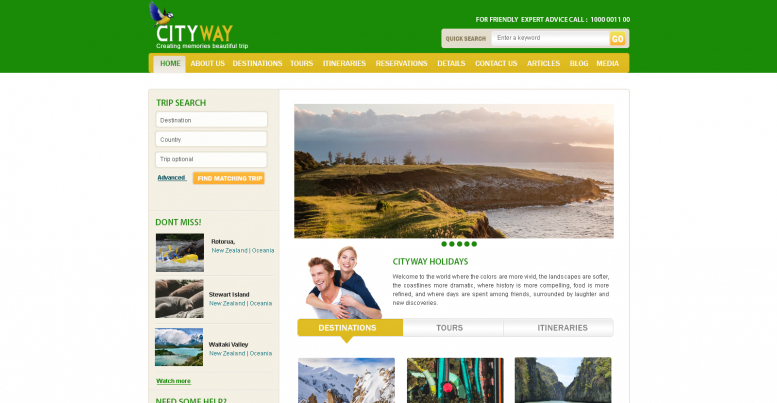 City Way is a Travel Agency Web Template, developed for travel agencies websites. A rich UI kit of this crossbrowser compatible theme allows you to build versatile layouts easily. One of the most important features that websites need nowadays is device responsiveness. People use smartphones, tablets, laptops, more often than PCs, which is exactly what drove us to make this template device responsive it changes design according to the device it is viewed from, hence it looks good on any of them. The homepage displays trip search which can be done using destination, country and trip keyword. You may also use advanced features. The Dont Miss section displays the top locations where trips can be made. Need Some help section displays the Frequently asked questions. Also, newsletter subscription and deals section are present. 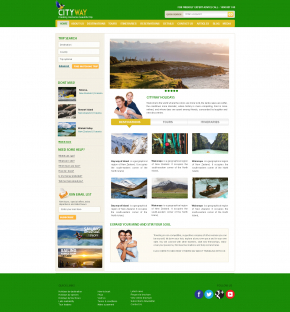 The homepage also displays an attractive banner slider along with different sections of best destinations, tours and itineraries. The footer of the template is very simple and features the important links. Free The simple license would allow you to use the template to create one website.